For those reporting this issue... when you post, would you please indicate which version of the Airbus you are using? We need that info along with any report. We really can't look at any reports without this information given that so many people are not using the latest Experimental Update and still reporting the issue. So that you guys are aware... I just completed 7, two hour-ish flights without any managed speed issues. Approx 15 mins into CRZ managed speed dropped to 104 kts. Problem is not fixed for me. Dave, suggest you try this flight plan KCLTTAPA01. It was created at www.SimBrief.com. This is the plan I was flying yesterday in v1.2.2.0 when the managed speed dropped out in CLB and CRZ. All of my failed flights have been with SimBrief created flight plans. I also load the A319 in TAKE-OFF state in P3Dv4.4. I'm planning another long flight tomorrow, KCLT-TNCA but I'm going to input the flight plan manually and see what happens re managed speed. Try SAN-PHX (HYDRR arrival). I always load the route manually. Sorry you're struggling with this issue. I've tested most every route reported and I just don't experience this issue. Just one of our guys has, so this has proven to be somewhat elusive for us all. If I get a chance to schedule it in, I'll try to fly the route you suggested, but I honestly don't think this is a route issue. The managed speed problem cleared after I reinstalled Windows, P3D and Airbus Pro, but i came back after I updated to version: 1.2.2.0 using the Aerosoft updater. CRZ phase, managed speed in PFD dropped back to 206kt. Could it be related to a high tailwind factor? Had to go back to selected speed to avoid stall. Pushed speed knob to see what would happen and managed speed dropped back to 117kt. Seems like the updater is introducing this issue and a reinstall is needed to clear it. I agree with djspatrick . I can re-install the release version 1.2.1.0 and I do not have the managed speed problem. At one time I was flying experimental version 1.2.1.3 and did not have the problem. I missed the v1.2.1.4 release but caught that when I updated to v1.2.1.5, so I'm not sure which release introduced the problem 1.2.1.4 or 1.2.1.5. As I discuss above, I have uninstalled, re-installed 1,2,0.0 and applied the experimental 1.2.2.0 via the updater. I still have the problem. Re his comment on high tailwind, I have flown my flights with Active Sky wx for P3Dv4 and almost (if not every) flight I encounter winds at altitude (generally FL350-360) in excess of 100kts. I'm preparing to start another flight. This flight, in addition to manually entering flight plan, I will also use the "Clear Skies" wx theme from P3Dv4. Will report results. UPDATE on flight with P3Dv4 Clear Skies wx theme and manually loaded flight plan. Didn't even make it to 10,000 ft in CLB before managed speed tanked! Obviously as has been acknowledged, there is an issue still affecting some users. I suspect we are all willing to test whatever to try and resolve this aggravating issue. One thing that works for me to re-establish managed speed is to change the destination runway. This often recalculates and established the correct managed speed. If I was just to look at my FMC Perf pages to see when managed speed drops, the best page in DES. Sometimes when the drop occurs in CRS, the CRZ page managed speed looks correct, but the DES page shows the drop to say, 204 kts. Tried the uninstall/reinstall then updater. Did not fix the problem for me. Thought I'd throw my hat in the ring on this as well. I'm running the latest version of everything and I've lost managed speed on all flights. This is all done in the A320 IAE for me. Sometimes it happens in the climb, other times in cruise. Right now doing a trip from KBOS-KRDU (KBOS SSOXS5 SSOXS DCT BUZRD DCT SEY DCT HTO J174 SWL KAROO2 KRDU). Flight plan is manually entered. Right now I have a headwind in excess of 100 knots, yesterday I had a tailwind in excess of 100 knots. That doesn't seem to matter - managed speed tanks regardless. When it drops during the climb, it looks like it's trying to achieve a speed constraint in the STAR for whatever airport I'm flying to (something around 206-220 knots), but when it drops during cruise it's usually some insane number like 105 knots. I see no correlation to any other speed listed in the FMC. At least if I could follow the logic of the speed it's trying to fly, maybe that would point to the problem. But the drop in cruise to something like 105 knots really throws me off that trail. Same issue here. Just updated to 1.2.2.0 yesterday and did a short flight KLAX-KSFO as a test. In cruise at FL320 the throttles went to idle and the speed dropped to where the airplane would have stalled without manual intervention. I never had this particular issue before 1.2.2.0. Descent VNAV is still a joke, leaving the airplane in full managed mode still results in blowing almost every speed/alt restriction and ending up way too high and fast at the IAF. Maybe a real-life Airbus pilot can confirm this, but it seems to me that the autothrottle does not reduce power enough in the descent. Even with spoilers deployed the vertical profile is impossible in managed mode. Further to the above: During managed descent from cruise, the system descends at 1000fpm whereas 2000 would be more realistic. Maybe this is an underlying cause of the VNAV issues? Is there a way to configure the default descent rate, either in the sim or buried deep in some config file? I've re-read this thread completely several times and I just don't suffer for any of the problems (not a one) mentioned here, and I likely have 10 times or better the number of flights in numerous versions than our customers do. Very frustrating for everyone concerned! I hope it isn't true, and I'm moving forward as if it isn't, but somewhere in the dark recesses of my mind a thought it forming that this my boil down to what is taking place on individual systems - which is about 400 times more difficult for us to help figure out than anyone might imagine. 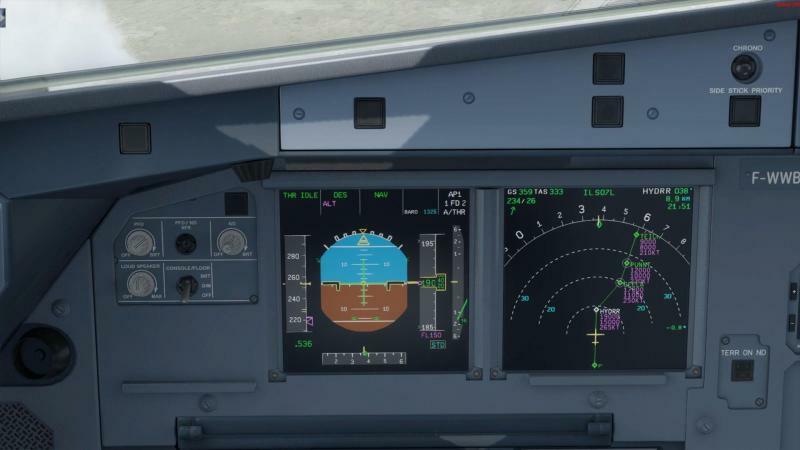 To clarify it a bit more - on initial descent from cruise, I'm getting that 1000fpm descent. When the airplane is a few miles from the next waypoint, it's like the system has an "oh crap" moment, realizes it won't make the speed/alt restriction, and suddenly starts descending around 2400fpm. Of course it's too little too late. I always end up having to use spoilers, which in normal real-life operations would not be necessary unless ATC caused a delay in descending. On my last flight I tried starting my descent ~15 miles before the FMS's computed TOD point. It came a lot closer to hitting the altitude at the next waypoint, but then lost it again on the next segment. This suggests to me a glitch in the VNAV program logic. My test flight was KLAX DARRK2.STOKD SERFR3 KSFO, ILS RWY 28R with EDDYY IAF. I was using the "Clear Skies" setting (all weather turned off). I have a very clean Win 10 install; I use that system only for games with no windows security or user account control enabled. All apps are run as admin, even though that shouldn't matter with UAC disabled. I'm happy to help diagnose; I'm a computer geek and programmer as well as real-life pilot. I've flown most every route that someone had a engine problem with, and I've never encounterd an issue. At this point I just can't believe it's a route issue. The updater theory has some merit, I will discuss this with the dev for that. For everyone who is having this issue, please report if you're using AI Traffic (whether generated by P3D, VATSIM, IVAO or by other means. Also, please report if you have or don't have any Carenado aircraft installed. Their is a DRM problem with Carenado software that will kill the engines of non-Carendo aircraft if the model is called by an AI aircraft. For those interested in helping rule this out.... please do the same flights without any AI/Online traffic and see if you still see the problem. My test flights are always done with all AI traffic turned off. I do have Carenado aircraft installed but whenever I complete a flight with ANY third-party airplane I always exit completely out of P3D and restart with a clean default startup flight (in my case, the P3D stock Baron in a cold and dark state), position at the departure airport and then load the third-party airplane. On my test flights today I did not get the sudden power chop and slowdown issue, just the managed descent problem mentioned above. Still seeing excessive bank angles during small course changes, but that is another topic. The managed descent is the really critical issue, for me anyway. RE the Carenado DRM problem. I do have Carenado a/c and I encountered this very issue when I first got the MadDog. Would be flying along dumb and happy and WHAM! Both engines shut completely off. Finally tracked it down to using vPilot to fly online in Vatsim. vPilot had done some mapping of my Carendo models. Once I understood the problem, the resolution was simple - exclude the Carenado/Alabeo models from mapping. No problem ever since. The problem lies with Carenado DRM and not vPilot software. The A319 does not exhibit the same problem - i.e. the engines completely shutting down. The managed speed just gets reset. Since the managed speed issue is happening to me every flight, I will fly an offline flight tomorrow without vPilot. I do not have any "traffic" programs running. Okay, thanks Harold, that pretty much confirms that isn't the problem, at least for those not as experienced with this as you are. I remember you from the Maddog thread! I also have the problem that suddenly the speed decreases during the flight. Did yesterday 3 flights with the a321 made. Unfortunately, my english is not so good for the error description. Unfortunately, you can not leave the cockpit until the TO because otherwise the plane crashes. Actually only fly boeing but for quite some time also airbus. I have no idea how to fix this error in flight. I turn off the autopilot, move the throttle and turn AT on and off. Then I get everything under control again. But that is not a solution. How does one exclude specific aircraft from being used as AI in P3D? Just noticed that my rogue CRZ managed speed was the same as the Descent target speed: 206kt. That is going to be add-on specific. I was talking about vPilot. See the attached image on how to do it in vPilot. Not to beat a dead horse as I know this has been accepted as an issue, but I want to second what djspatrick said. I was just in CLB managed mode when the managed speed dropped to the same value that was erroneously shown as the speed (.78/207) on the DES page. Note that the CLB page, however, still thinks the managed speed should be 295/.78 but the a/c is following the DES speed. When I got to cruise, the CRZ page showed .78 as the managed speed, yet engaging the managed mode the target speed dropped to 111. Maybe this info will help someone look in the code to spot the problem. But still we have the problem that we can not reproduce it. I did flight with the A321IAE today again and did not see this issue, nor did I see it with other models in the last days. How to tell? No other a/c appears broken but the Aerosoft A319. I ran the uninstaller and appear to get a clean uninstall. What else to do? No indications of problems. Ensured that last install and updater were run as Admin.